The main page of the yearly iGEM wiki is constantly changing. We make an effort to keep all pertinent information easy to access from the main page. Occassionally, though, you may find that a link that you saw before is no longer easy to find. Please use the links below to go back to the main page for each iGEM season. We hope that this will be a valuable information resource for past, current, and future iGEM members. The Jamboree is fast approaching! The wiki freeze is tonight! Be sure to have all of your project information on the 2009 iGEM wiki by 11:59pm EDT. You will not be able to make any edits to the wiki after that time. Update: There were some wiki loading issues leading up to the wiki freeze. To find out more see the report page. You can now submit your team's judging form! The forms are due on October 21 at 11:59pm, EDT. You may edit the form up until the deadline, at which point the wiki will freeze and you will not be able to make any changes. Note: Software tool teams now have a specialized version of the judging form that reflects the medal requirements for software teams. There is only ONE week left until the wiki freeze! Be sure to finalize all of your information on the iGEM wiki and the Registry before the deadline so that the judges can review your project. The judging form is also due on October 21 at 11:59pm, EDT. The form will be released shortly so keep checking 2009.igem.org for updates. The Jamboree is less than a month away, and although you must be busy with preparations, you should also think about your team t-shirts. You're representing your team and university, so why not show off! 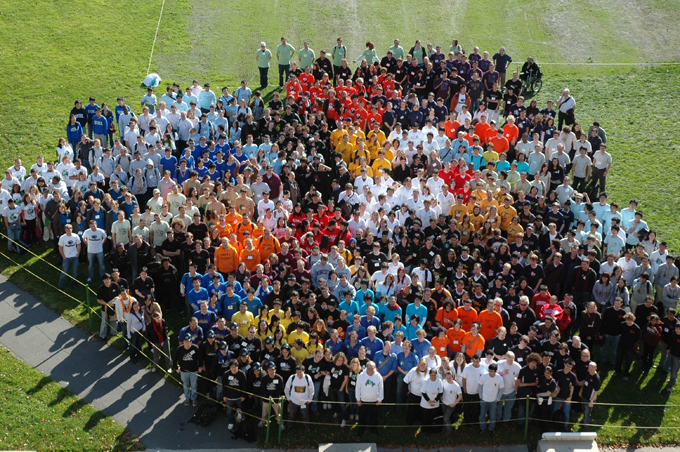 Design and wear your team t-shirt, especially for the iGEM from Above photograph. And since this year's Jamboree falls on Halloween (October 31) weekend, it'll be fun to have a team costume or mascot. UPDATE: 50 more rooms have been added to the iGEM room block at the Hyatt. We are also currently working on setting up a room block with another area hotel. As soon as we have any new information, we will post it here. The iGEM room block at the Hyatt Regency hotel is almost sold out! If you would like to take advantage of the room block, book your rooms right away. See booking details on the Hotels page. The Judging page has been updated with information about poster judging. Submit your preliminary project track by August 7! The judging committee would like to get a sense of team track selection. Please send an email to HQ with "Preliminary Project Track" in the subject stating which track you think your project fits in to. See details on the Track page. Note that this is NOT the final track selection before the Jamboree. If you have a question about anything iGEM-related, from lab questions to fundraising, to team t-shirt styles, ask it on the iGEM forum! See details on the forum details page. 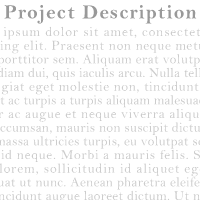 Preliminary project descriptions are due on August 1. Are you holding a regional team meetup? Getting together with other iGEM participants? Holding a fundraising event? Tell the iGEM community all about it on the summer events page. GENEART is once again joining iGEM this year as a sponsoring partner. The company will be offering low-cost DNA synthesis to all iGEM teams this year. See the Partner Offers page for more details on how to take advantage of this great offer. We have a new way for iGEM team members to get their visa invitation letters. Instead of emailing your information to iGEM HQ, you can enter your information on your 'My Account' page, submit it, and download your invitation letter. See the Visa page for instructions and details. If you require an invitation letter from iGEM Headquarters in order to obtain a visa to travel to the Jamboree, you must request the letter by June 1. In iGEM 2008 there were several teams that were not able to attend the Jamboree due to visa problems. In order to avoid a similar problem this year, we are asking that all teams apply for visas by June 1 at the latest. See the Visa page for more details and information. The date for the Europe workshop has now been finalized! It will take place on the weekend of June 20/21 at Imperial College in London. See the Europe workshop page for more details. The 2009 spring DNA distribution will ship by early next week. 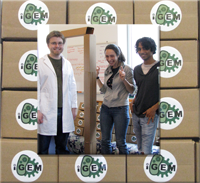 All iGEM teams that have provided a shipping address will receive the distribution. The distribution does not contain the complete set of parts in the Registry. Instead it is made up of a smaller subset of high quality parts and iGEM 2008 team favorite parts. Kits will be shipped via USPS for US teams and via DHL for non-US teams. Tracking numbers will be available on request. Q: What do we do with these plates? Find out how to locate parts in the plates and what to do with them on the Registry 2009 DNA distribution page. Many thanks to our iGEM 2009 technicians, Paul, Jess, and Vinoo, (pictured above) for their hard work in preparing this year's DNA distribution. The date for the Asia workshop has been finalized. It will take place on the weekend of June 27/28 at Tokyo University in Tokyo. See the Asia workshop page for more details. 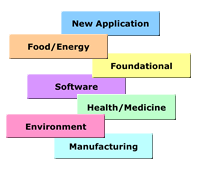 The schedule for the spring workshop at MIT has been finalized. See the MIT workshop page for more details. If you haven't done so already, make sure to register for the event. The Mathworks, an iGEM sponsoring partner, is hosting a complimentary webinar on April 24. The webinar will introduce iGEM teams to SimBiology, a MATLAB based tool for modeling, simulating, and analyzing biochemical pathways. See the Partner Offers page for more details. If you are interested in participating in the experimental track for iGEM 2009, send an email to iGEM HQ with the subject iGEM 2009 Experimental track. One of the requirements to participate in this track is that your team must be affiliated with a university or a formal educational institution. See the experimental track page for more details and requirements. University or educational institution you are affiliated with. iGEM 2009 team you are affiliated with (if applicable). The kind of project you will be working on. Number of people on your team. Deadline: Emails must be received by May 1. We are working on finalizing the workshop dates and locations. MIT Workshop: Finalized! May 16/17 on MIT campus, Cambridge, MA. Europe Workshop: Most likely May 30/31 in London, UK at Imperial College. Asia Workshop: Most likely June 27/28 in Tokyo, Japan at Tokyo University. If you have any thoughts on any of these dates or locations please send email to iGEM HQ. We currently have 106 teams registered to participate in iGEM. While registration ended on March 31, teams may still register for iGEM. We have heard from more teams who are interested in participating in iGEM 2009.
iGEM HQ needs to finalize the venue for the Jamboree. We will be selecting the venue this week. In order to finalize the venue we may have to limit the number of teams that are able to participate in the Jamboree. Teams who still wish to register will be accepted on a first-come, first-served basis. So, make sure to register for your team if you have not already done so! The Mathworks, makers of MATLAB, have once again joined as an iGEM sponsoring partner. They will provide iGEM teams with MATLAB software licenses and a SimBiology Webinar. To see more details on how to take advantage of the Mathworks offer, see the partner offers page. Regular team registration closed on Tuesday, March 31 at 11:59pm EST. Teams may still register for iGEM but the team registration fees is now $1750 USD. Team Registration Fee page for details about payment. Registration ends on Tuesday, March 31 at 11:59pm EST. After this deadline, team registration fees will be subject to a $500 late fee. See the Team Registration Fee page for details. Wire transfers and checks must be postmarked by the deadline so as not to be charged the late fee. Head to the iGEM 2009 Registration page to apply for your team. Make sure to apply before the March 31 deadline. Read the requirements to participate in iGEM on the Requirements page. Need help? Read the Registration Handbook, read the FAQs, or contact iGEM Headquarters. The iGEM 2009 Jamboree will be longer than in past years. See the Jamboree page for more details. iGEM 2009 is introducing an experimental track for DIY Biologist and other non-competition teams. See the experimental track page for details. 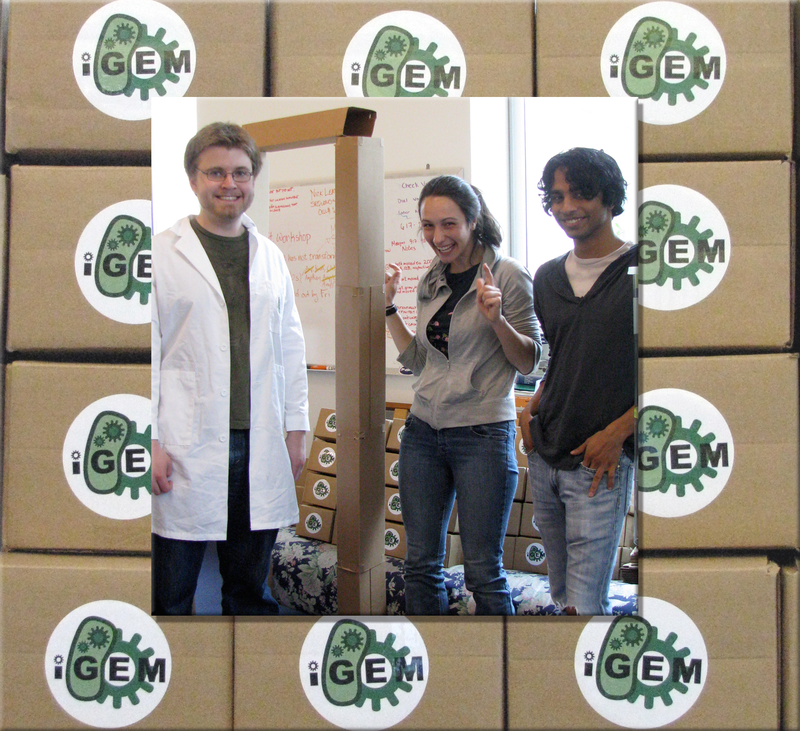 Interested in starting an iGEM team for 2009? Check out the Start A Team page for suggestions. 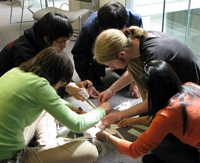 Want to learn what happened at iGEM 2008? Head to 2008.igem.org to get some great ideas.